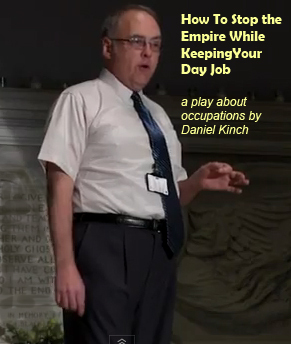 This is a full-length version of my play HOW TO STOP THE EMPIRE WHILE KEEPING YOUR DAY JOB. It’s coming to a park near you this summer. Expect me. (or you can call me and book me into your theater, community center or Bar Mitzvah and THEN expect me). HOW TO STOP THE EMPIRE WHILE KEEPING YOUR DAY JOB is the story of Jerry, a middle-aged troublemaker/activist. No longer able to keep in a more ‘active’ mode in the Movement, he has cobbled together a list of the things that work when bringing truth to power. The play was originally developed in 2005 and has been rewritten to reflect the Occupy movement. There have been multiple performances of HOW TO STOP THE EMPIRE WHILE KEEPING YOUR DAY JOB since November 2011, and a YouTube video of a shortened version has garnered over 10,000 viewings. The play can be performed on short notice at protest sites and community centers in and out of doors. For information about the tour, click here.